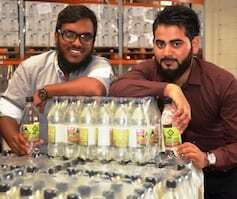 A Birmingham based business is distributing thousands of bottles of water during Ramadan. Brunei Wafirah UK has made its first step in sourcing its products from the UK with the distribution of 10,000 bottles of Brunei Halal Branded water from Devon to be given out at mosques during the holy month of Ramadan. The Devon water is the first product that the company has sourced from the UK but it is only the start of things to come. Brunei Wafirah UK will be manufacturing and purchasing an increasing range of its food and drinks from the UK under the Brunei Halal Brand. The water from a spa in North Devon will be free to all that want it and is being delivered to a number of mosques in the UK. Worshippers will be able to quench their thirst whilst attending evening prayers. The water bottles have instructions for people to complete an online questionnaire and anyone who does will be entered into a free prize draw and will have a chance to win a range of prizes including an ipad and digital cameras. Brunei Wafirah UK is a Birmingham based company backed by the Brunei government that is moving into the UK and European market for high quality halal food and drink.